CLICK HERE to listen to episode audio (5:15). All Web addresses mentioned were functional as of 6-16-17. From the Cumberland Gap to the Atlantic Ocean, this is Virginia Water Radio for the week of June 19, 2017. This week, the sound of the James River at Lynchburg opens a revised repeat of a 2013 episode—a “double-header” of music and sounds to mark the annual James River Batteau Festival. Batteaux [the plural of batteau] were wooden, shallow-draft boats used on the James and many other rivers and canals to transport goods in the 18th and 19th centuries. Such boats have been called the tractor-trailers of their day, traveling on water-based highways. The batteau era ended with the widespread building of railroads in the 1800s, but the annual batteau festival—an eight-day float down the James on replica vessels—recalls the boats, crews, costumes, and lifestyle of the era. The 120-mile float in 2017 starts in Lynchburg on June 17 and ends at Maidens boat landing in Powhatan County on June 24. We mark this unique water event first with a 45-second excerpt from a song about river boatmen losing their jobs to the railroads: “James River Blues,” by Old Crow Medicine Show on the 2006 album “Big Iron World,” from Nettwork Records. Following the music are about 90 seconds of sounds from the batteau festival launch in Lynchburg in June 2013. The speaker is Jeff Taylor, the emcee at that event, and the loud boom you’ll hear is a replica cannon on one of the boats. This episode is an updated repeat of Episode 166 (6-17-13); that episode has been archived. “James River Blues” and “Big Iron World” by Old Crow Medicine Show are 2006 copyright Nettwork Records, used with permission. More information about Old Crow Medicine Show is available online at http://www.crowmedicine.com/. 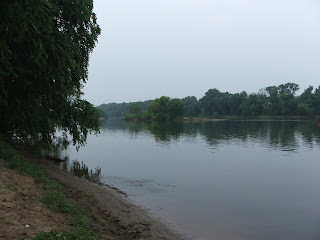 Short segments of “James River Blues” are also included in the following Virginia Water Radio episodes: Episode 220 (6-30-14); Episode 251 (2-2-15); and Episode 334 (9-19-16). Sounds from the 2013 Battteau Festival launch were recorded by Virginia Water Radio on June 15, 2013, on Percival’s Island in Lynchburg. The band heard playing at that launch was the Virginia group Chamomile and Whiskey; information about that band is available online at http://www.countywidemusic.com/members-app/chamomile-and-whiskey. Three photos above: views from the June 15, 2013, James River Batteau Festival launch at Lynchburg, Va. The stopping point for the 2017 James River Batteau Festival: the James near Maidens, Va., on the Goochland/Powhatan county line, shown here on June 19, 2007. A photo gallery by the Lynchburg News & Advance of the 2017 James River Batteau Festival launch is available online at this link. James River Association, “The Lynchburg Launch Festival,” online at https://jrava.org/lynchburg-launch-festival/. Minnie Lee McGehee, River Boat Echoes—Batteaux in Virginia, Virginia Canals and Navigations Society, McLean, Va., undated. Virginia Canals and Navigations Society, home Web page at http://vacanals.org; and “James River Batteau Festival, online at http://www.vacanals.org/batteau/. Virginia Canals and Navigations Society, James River Batteau Festival 2017 brochure, online (as PDF) at http://www.vacanals.org/batteau/wp-content/uploads/2017/03/JRBF_2017_Brochure.pdf. City of Lynchburg, “James River Batteau Festival,” online at http://www.lynchburgvirginia.org/events/arts-culture/james-river-batteau-festival/. Canoe is resurrected for Batteau Festival, Lynchburg News & Advance, as published by Roanoke Times, 6/18/15. James River Batteau Festival launches a trip downriver ... and back in time, Lynchburg News & Advance, 6/17/17. 6.7 - natural processes and human interactions that affect watershed systems; Va. watersheds and water bodies. USI.2 – major land and water features of North America. USI.8 – westward expansion and reform from 1801-1861. VUS.6 – Major events in first half of 1800s.